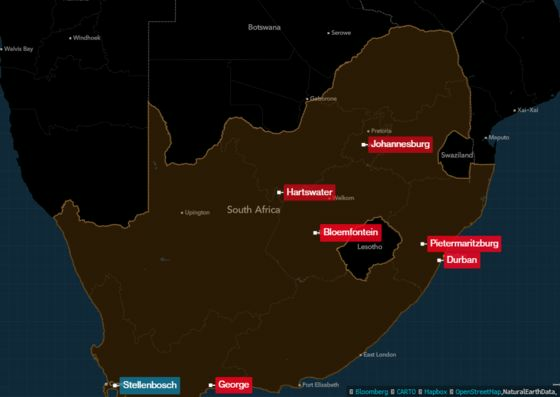 (Bloomberg) -- A black beetle the size of a sesame seed is killing South Africa’s trees, and no one knows how to stop it. After arriving from Southeast Asia about four years ago, the polyphagous shot-hole borer has spread a thousand miles across South Africa, from the eastern city of Pietermaritzburg, where it was discovered in 2017, to indigenous forests on the west coast near Cape Town. An unwelcome side effect of globalization, the pest is believed to have arrived along with wood pellets on a ship. 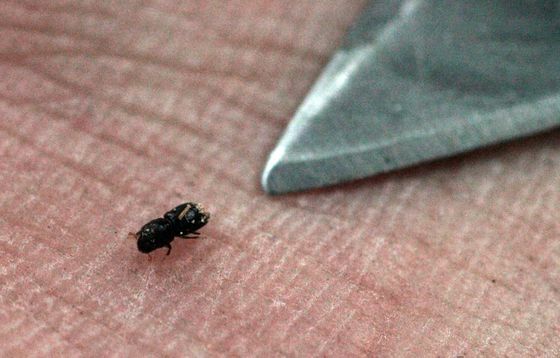 The polyphagous shot-hole borer, or PSHB, first drew scientific attention in 2008 after infesting avocado orchards in Israel and was then found burrowing into millions of trees in urban southern California. Now, South Africa is probably facing the largest invasion by surface area to date. The pest is likely to drastically reduce the green canopy of Johannesburg, one of the largest man-made forests in the world, with some tree experts saying that as much as 30 percent of all trees could die. It could also hurt the country’s avocado, macadamia, wine, stone-fruit and pecan-nut industries, which account for a large slice of the nation’s $11 billion of agricultural exports. At risk too are the iconic oak trees of Stellenbosch, the de-facto capital of South Africa’s scenic winelands. While most types of the beetle prefer dead or dying trees, the polyphagous shot-hole borer is one of fewer than 20 bark beetle species worldwide that aggressively target an extraordinarily wide range of healthy trees, said Wilhelm de Beer, a forest pathologist at the University of Pretoria who’s leading a nationwide PSHB network that includes researchers from eight universities. The beetle has infested pecan nut orchards in the Northern Cape province, and the avocado industry in the north east of the country is monitoring for a potential outbreak. Macadamias, peaches and grapevines may also be affected, according to the Department of Agriculture, Forestry and Fisheries. While the government has pledged 5 million rand ($354,000) for research on pest control, most funds so far have come from commercial agriculture -- pecan, macadamia and avocado farmers. The female beetle burrows into trees and leaves fungus in the tunnel for her offspring that contains a pathogen that blocks the circulation of the tree. Some, planes particularly, become reproductive hosts, or breeding grounds, and the fungus is always lethal for the English oaks, Chinese and Japanese maples, and box elders. The beetle can’t fly but reproduces rapidly and has no known natural enemies in Africa. That’s why Johannesburg has been hit hardest: Its avenues are lined with as many as 10 million primarily exotic trees, most of which were planted during a gold rush that transformed it from a dusty mining camp into a sprawling metropolis of 10 million people within 130 years. The city has countless parks, and residents in wealthy suburbs own relatively large properties, which has created a thriving cottage industry of gardeners, tree fellers and tree surgeons. From vantage points in the north of the city the tree canopy spreads as far as the eye can see. But there is no accurate data on the total number of trees or the population of each species, complicating efforts to control the pest. While it’s possible to inject trees with fungicide and insecticide, the treatment only works if trees aren’t big or too heavily infested and won’t eliminate a large-scale invasion such as the one in Johannesburg, De Beer said. “It’s toxic for the trees and only feasible for individual high-value trees in a garden,” he said. Cutting down all the infested trees isn’t an option either - it risks spreading the pest even more rapidly if, for instance, the wood is harvested for firewood and not treated with the appropriate care. Developing a biological control program may take between 5 to 10 years, he said. Worried Johannesburg residents have started marking dead or dying trees with red paint or plastic ribbons and created WhatsApp groups to discuss the invasion. Many are outraged by what they see as the slow response of City Parks, the department in charge of parks and green zones, said Julian Ortlepp, a tree surgeon who sent an angry letter on behalf of residents to mayor Herman Mashaba in February. Still, municipal authorities say it’s too early to classify the invasion as a disaster. City Parks, which is hosting public meetings and cutting down dead box elders, has started mapping the health of trees in highly infested areas, according to spokeswoman Jenny Moodley. But it’s hard to deal with a “complex little monster” for which no chemical or biological remedies exist, she said.